This is a song loved by many children including mine. 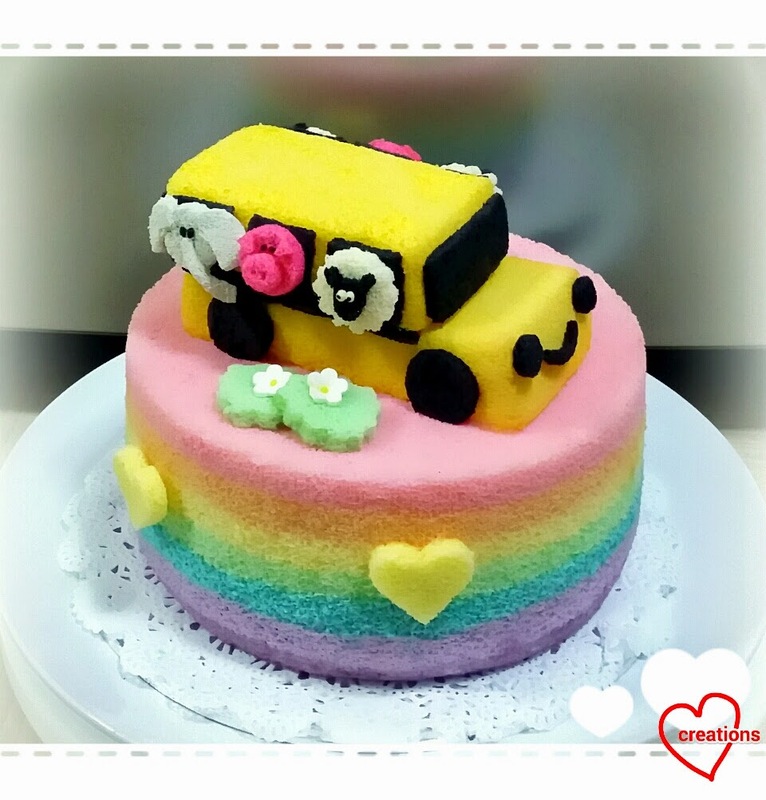 This animals bus rainbow chiffon cake is for a boy who's crazy over "the wheels on the bus" song with cute animals. The animals are peaking out of the windows of the happy school bus! Elephants, pigs, lambs and even pandas are going "all through the town"! 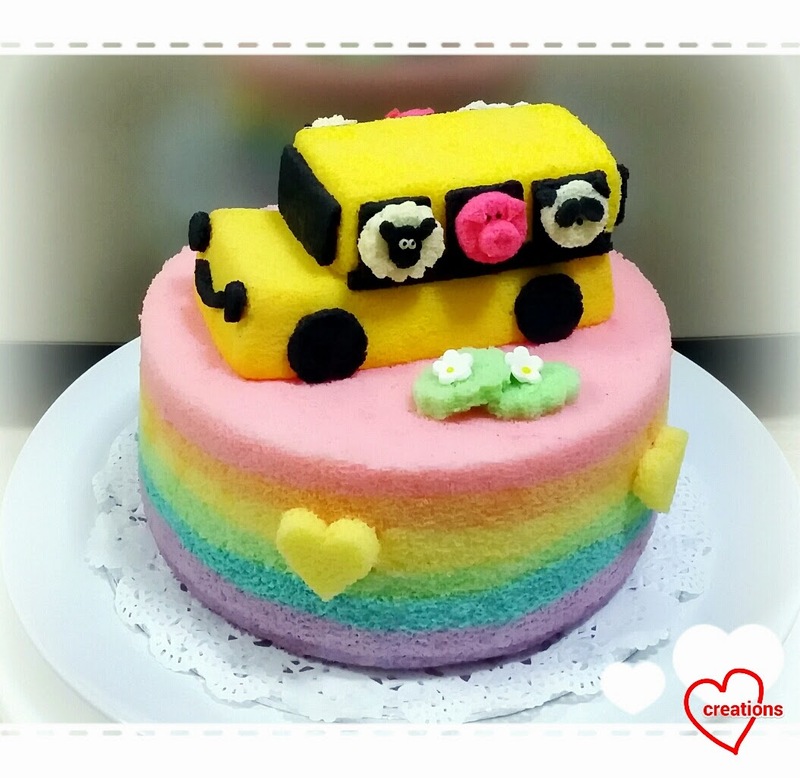 For those who are familiar with my work, you may recognize the rainbow chiffon cake and the school bus chiffon cake which are both creations that reappear in my bakes. My bus (and vehicles) always comes with a smile LOL! 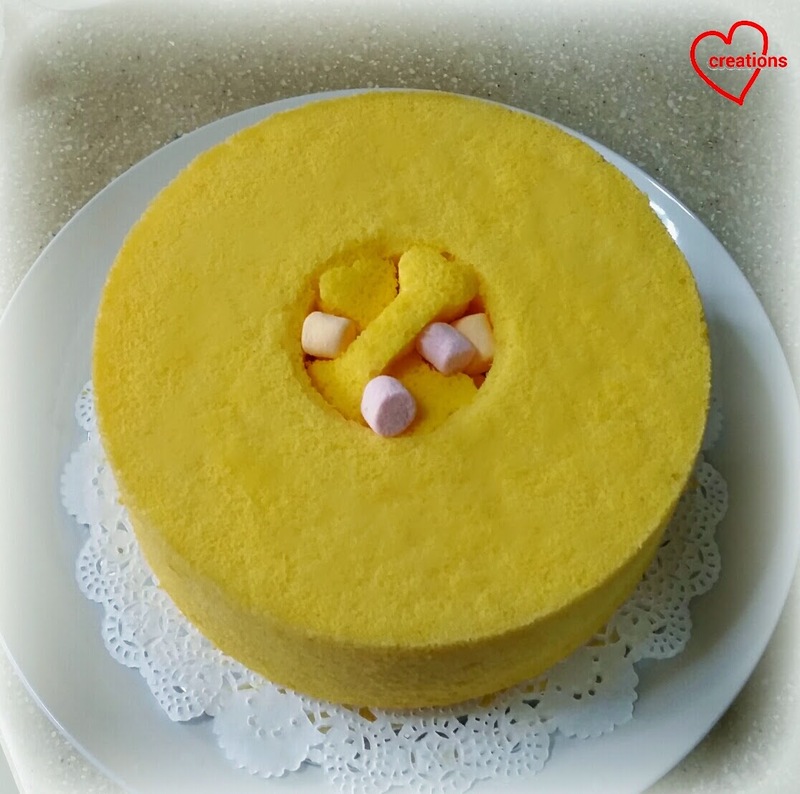 For my details on the school bus, you may go to my previous post vanilla bus chiffon cake. The base chiffon is a 7-colour pastel rainbow chiffon cake which I have also shared previously. 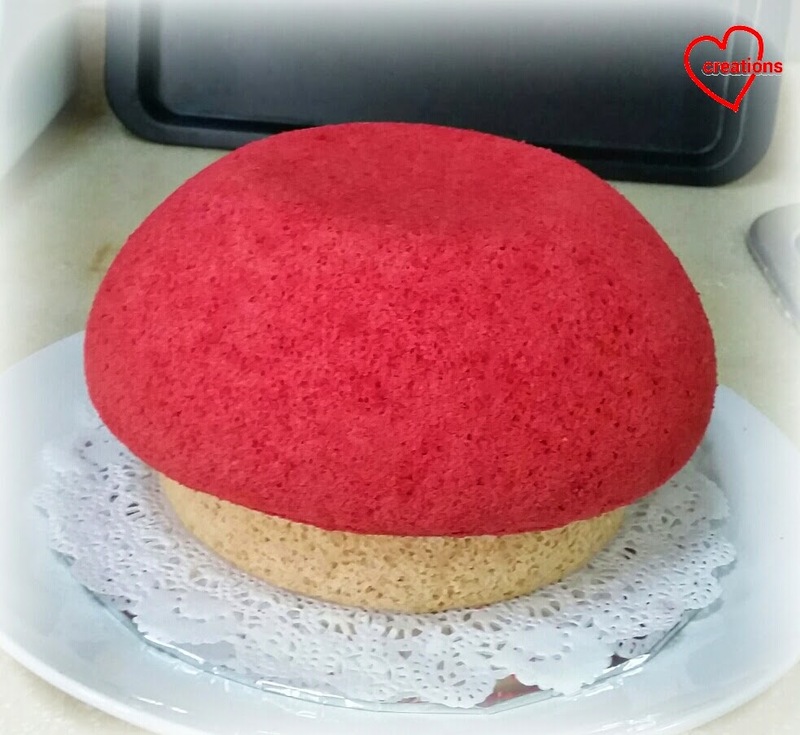 It it an adapted version of the original pastel rainbow chiffon cake with a final layer with blueberry juice. You can find the recipes in the previous links. The animals were all cut out from layer vanilla chiffon cakes (white, black, grey and pink) and glued on with melted marshmallows. Needless to say, they were quite a bit of work and I felt I had to take a long break after that :p. But I'm really thankful the kids loved the animals and the cake was well-received! I still have some lotus paste leftover from Mid-Autumn Festival so I made a small batch of cutesy baos for my kids :). All naturally coloured! Check out the awesome fluffiness! It's a challenge to make these with kids to take care of because of the proofing times and steps involved. I experimented with doing the first proofing in the fridge until I was free to deal with the dough. You should proof the dough in a warm place whenever possible but I was hard pressed for time. I didn't stick to the proper proofing times and roughly kept track of the second proofing time before rushing the baos into the steamer. So I was pleasantly surprised that the baos were very soft and fluffy and had no hint of alcoholic taste (an indicator of overproofing). 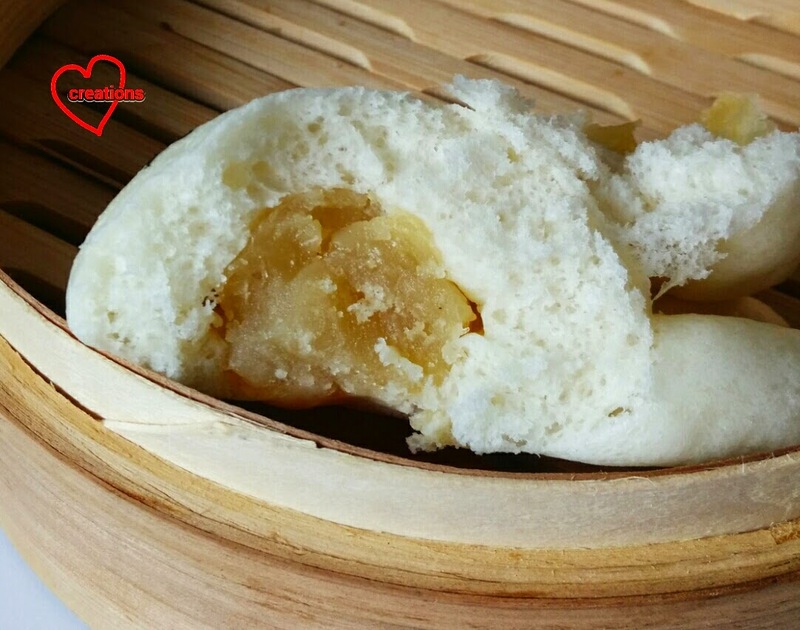 It's a pity the mooncake filling as bao filling didn't taste so great :p. My kids would have preferred liu sha (salted egg custard) filling but they had so much fun eating the cute, soft and fluffy baos! So feel free to use any savoury or sweet filling that you like. Just remember not to be over-generous with the filling if you are making cute baos. So here's the bao recipe for busy people! 1. Mix all dry ingredients except baking powder together in a bowl. Take 1/2 tsp of water from the 70g batch and dissolve the baking powder in it. 2. Make a well in the center of the dry ingredients and pour the water in. Stir with a spoon until a sticky dough forms. 3. Pour the dough onto a non stick mat and gradually knead in baking powder wth water. Gradually knead in shortening. Continue kneading until dough is smooth and elastic and passes windowpane test. About 25 minutes total hand kneading time. You may choose to use an electric mixer to do the job but you will have to triple or quadruple the recipe. 4. If you have time, let the dough proof in a lightly greased bowl covered with cling wrap until double in size or about 30 minutes in hot Singapore. 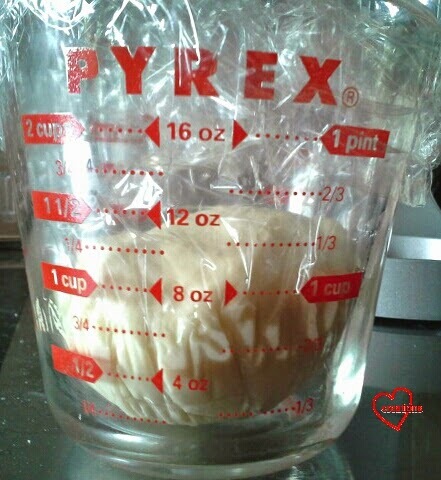 I placed my dough in a measuring cup with cling wrap and placed the dough in the fridge immediately to proof. This helps me to estimate how much more the dough needs to proof if necessary. Colour the dough yellow with tumeric or gel food colouring. Colour the dough red with beetroot juice or gel food colouring. If you have to rush off somewhere again like me, you can colour the dough and chuck it back in the fridge after wrapping them up. 6. 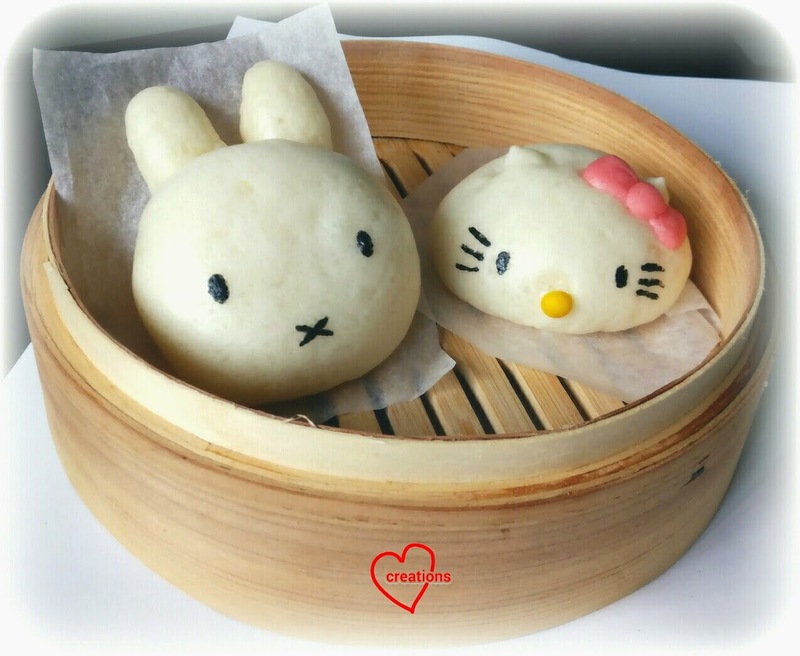 To make Miffy, simply wrap a ball of lotus paste with 30g of plain dough, placing seam side down onto a small piece of baking sheet. Lightly dust your work surface with flour. 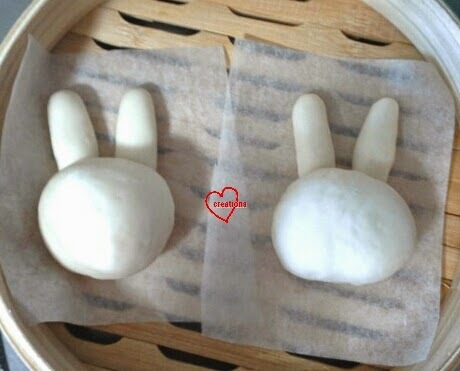 Roll out 2 long ears and place one edge slightly under the wrapped dough. Loosely cover with cling wrap and proof for 40 minutes. 7. To make Kitty, please refer to Fong's Kitchen for the lovely tutorial. I snipped Kitty's ears a little too high up on the ball of wrapped dough so the shape is a little wrong. Snip the ears slightly towards the back of the head instead. Remember to add a bit of plain dough to support the ears at the back. Add on the nose and ribbon and proof it in the same way as Miffy. 8. Steam on high heat for 6 minutes. Turn off the heat and let it sit in the steamer/ wok for 2 minutes before taking the baos out. Mix the charcoal into the egg yolk. Use a chopstick to print on the eyes, dragging it downwards a bit to create an oval imprint. Use toothpick to draw on Miffy's mouth and Kitty's whiskers. Return to steam on high heat for another 1-2 minutes. Let it sit in the wok covered for another 2 minutes before taking the baos out. Enjoy while it is hot! If you are not consuming immediately, keep them in airtight bag or container and freeze after they have cooled completely. Resteam for 15-20 minutes before eating. They will taste almost as good as freshly steamed. My friend who is a fan of anything Earl Grey flavoured requested for iced gems with this flavour. I made earl grey iced gems a while ago but this time, I left them in their natural colours and used more teabags for a stronger bergamot fragrance :). The recipe and steps are about the same as my previous earl grey gems post but I will put it here for your convenience. 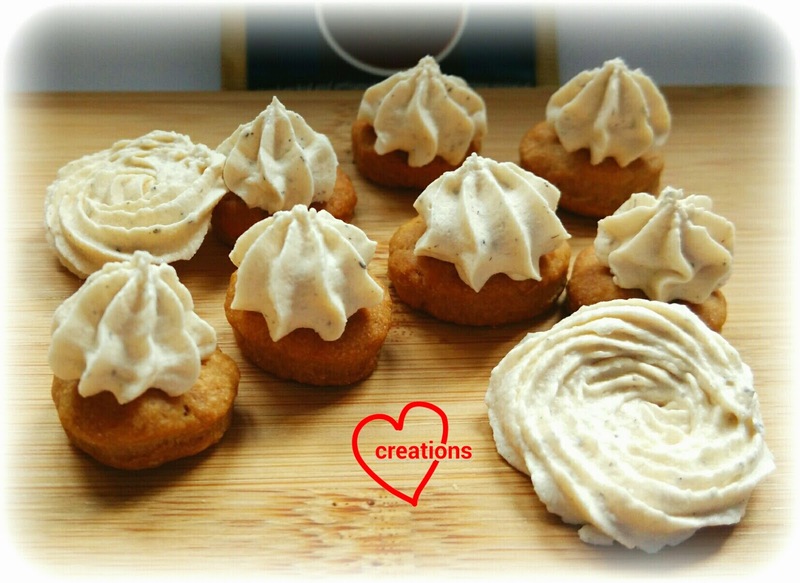 * If you are unable to get hold of meringue powder, you may prepare royal icing using egg whites. If you are concerned about using raw eggs, you may dry the iced biscuits in the oven at 90-100°C for half an hour to "cook" the egg whites as well as dry the icing. 1. Add vanilla extract to the milk. Set aside to cool if milk is hot. 2. Preheat the oven to 170°C (fan mode). Line baking tray with baking sheet. 3. Mix all dry ingredients together and sift into a large bowl. (You may double the recipe since this is a small batch). Rub in the shortening with your finger tips until it resembles fine breadcrumbs. 4. Gradually add in the milk until you can form a ball of dough. You won't need to use all 50ml of it. Roll it to thickness of about 3mm. Use a round cutter to cut out circles of about 2cm in diameter (or any size that you have). 5. Place the cut out dough on baking tray. They can be placed pretty close together as the dough will puff up and not expand much sideways. Press it down a little in the middle. Bake for 12-15 minutes or until lightly browned. Cool on tray for 5 minutes before transferring to cooling rack. 6. Prepare the royal icing. Sift icing sugar and meringue powder into the mixing bowl. Use an electric mixer to mix on low speed for a minute. 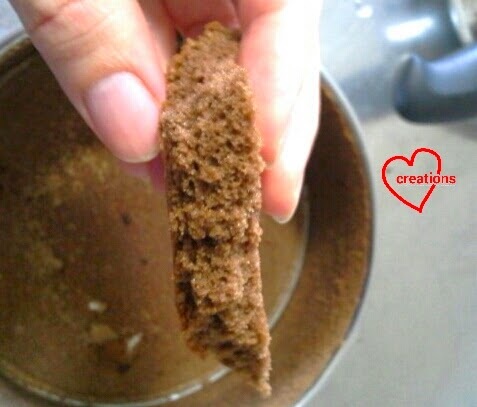 Gradually add warm tea and increase the speed to medium high, scraping the sides of the bowl when necessary. Add tea leaves from one tea bag and continue mixing for a total of 5-6 minutes or until stiff peaks can hold and the mixture turns pale. 7. Transfer the royal icing into piping bag fitted with a star tip. Pipe the signature dollop of icing on each biscuit. Dry the iced biscuits in the oven at 70-80°C using the fan mode for half an hour or until the icing is dry. You may pipe extra icing onto the baking sheet beside the iced bicsuits on the same tray as a test to see if the icing is dry (as you can see, I tried to pipe some earl grey rosettes). If you can easily lift the icing off the baking sheet, it is dry. 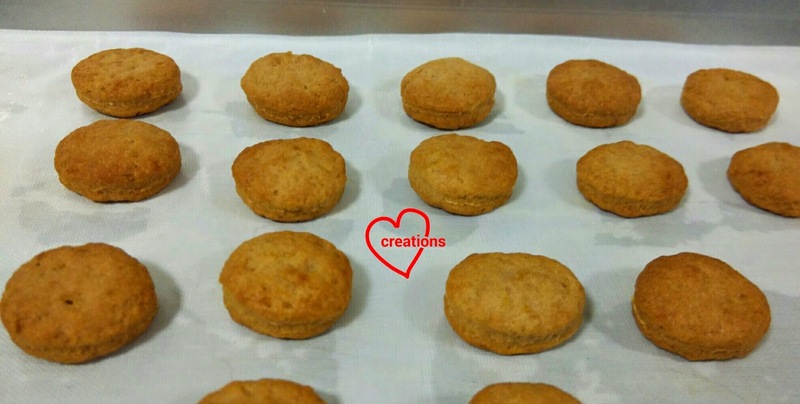 Let the biscuits cool completely before storing them in airtight container. So glad that my friend loved the biscuits! Feedback was the biscuit base is nice and crunchy and the icing is not too sweet. Earl grey fragrance is there without being overwhelming. But for earl grey fans, stronger earl grey flavour is always a welcome. If you would like to increase the earl grey flavour, add another teabag worth of tea leaves into the icing although the texture may be a bit more sandy. Checkout a variation of these Earl grey gems with salted caramel! 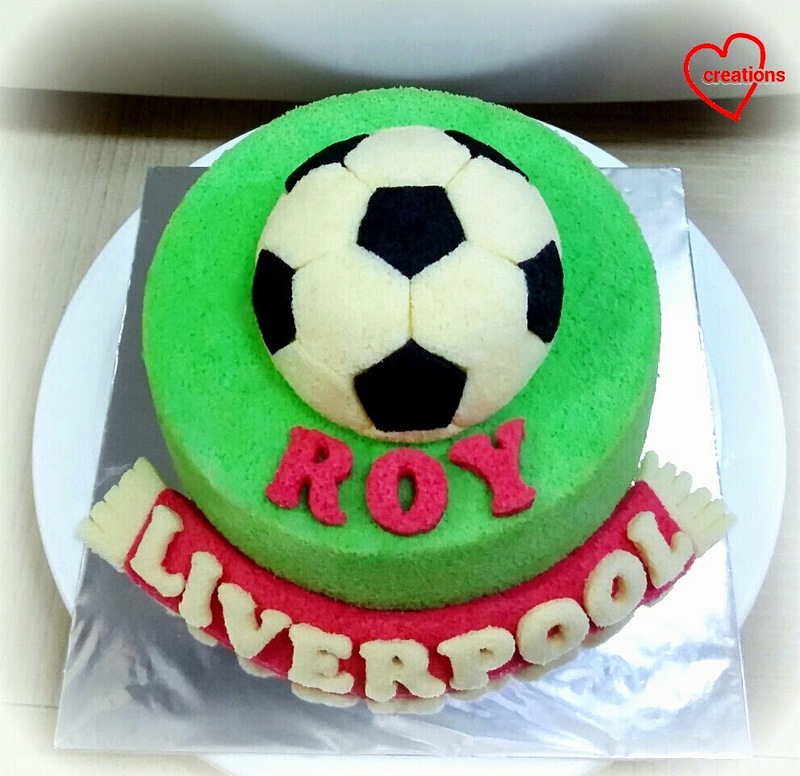 This is a Liverpool FC-themed chiffon cake for my friend's hubby who is a Liverpool fan! The colour theme is hence green and red like the club logo and decorated with a football on a green field with a Liverpool red scarf :). I wasn't confident with painting balls so I decided to cut hexagons and pentagons from layer vanilla chiffon cakes (black and white) and paste it on a ball vanilla chiffon cake after studying how the footballs looked (using melted marshmallows). 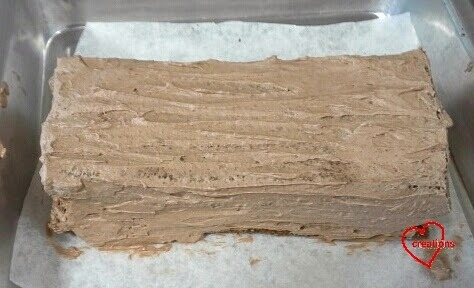 The scarf was also cut from a swissroll-type layer chiffon cake, with tapering at the ends. The green base is pandan chiffon cake similar to Olaf pandan chiffon cake (scroll to the bottom). I tried Bake King pandan paste this time (in addition to fresh pandan juice) and found the green colour a lot brighter than the Redman brand. Thank God my friend shared her nieces and nephew all loved the cake! Happy blessed birthday to Roy! 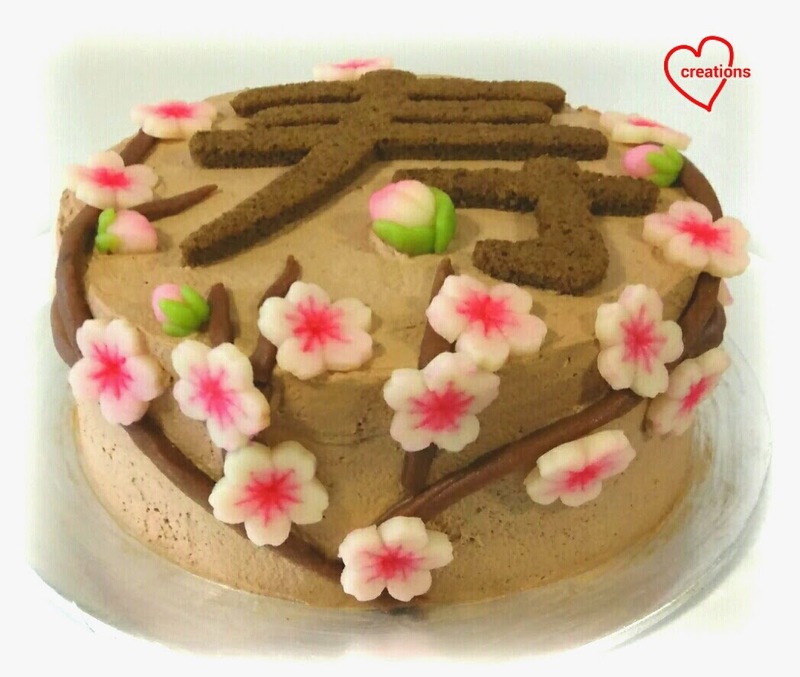 My friend requested for a small chocolate coffee cake for her mum's birthday with a longevity peach theme so I made this three-layered chocolate coffee cake with mocha cream and snowskin "fondant" decorations :). Yes, there's a peach. 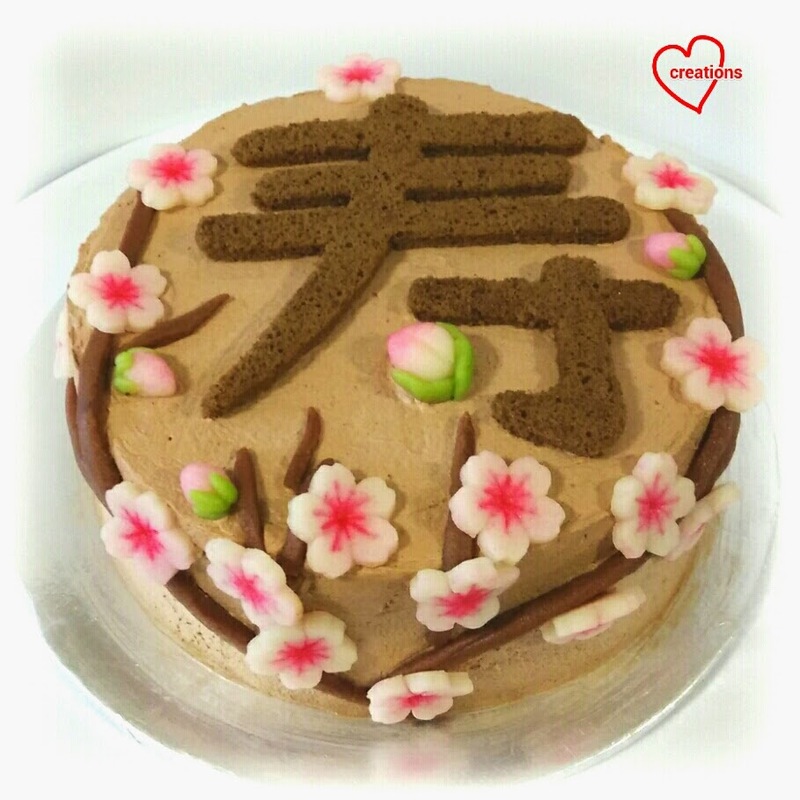 A tiny one for the "点" :p. But I made lots of peach blossoms to accompany it. 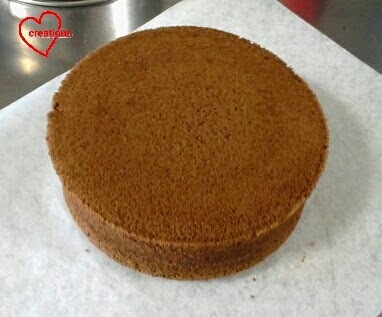 I adapted the recipe for the sponge cake and cream from Joy of Baking. 1. Preheat the oven to 160°C and place the rack at the second lowest position. Line the square tray with baking sheet. If your 6" round tin has no removable base, line the base with baking sheet too. Mine was removable so I didn't line it. Wrap the 6" tin with cake strips if you wish. I wrapped mine with homemade cake strips made from wet newspaper wrapped in aluminum foil. If you don't use cake strips, reduce baking time by 5-10 minutes. *Alternatively, you may bake three 6" round layer cakes if you have enough pans. Adjust baking time accordingly. 2. Prepare the egg yolk batter. Whisk egg yolks and sugar until pale and all sugar has dissolved. Add oil and whisk until thick like mayonnaise. Add coffee, milk, vanilla extract and kirsch. Whisk until well combined. Gradually add in sifted flour, cocoa powder, salt, baking powder and baking soda. 3. Prepare the meringue. In a clean metal bowl, beat egg whites until foamy. Add cream of tartar and beat unil soft peaks form. Gradually add in sugar and beat until stiff peaks form. 4. Fold in the meringue into the egg yolk batter in three additions. 5. Scoop enough batter to line the base of the square tin and pour the rest slowly into the 6" round tin. Bake the thin layer cake for 10 minutes. Immediately remove from tray and carefully peel off the baking sheet. Cool completely with another sheet over it. Bake the 6" cake at 160°C for 15 minutes followed by 150°C for 25-30 minutes or until the cake springs back when lightly pressed. Remember to adjust baking time accordingly if you are not using cake strips. Leave to cool on cooling rack before unmoulding by hand or spatula. 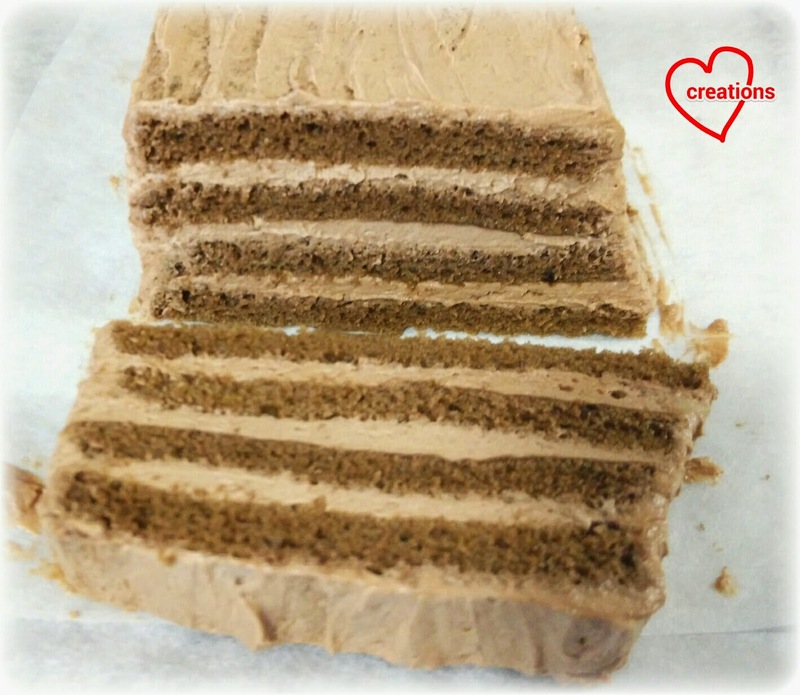 Slice the cake carefully into three layers with a serrated knife. Double wrap each layer in cling wrap and freeze it. Rigid cakes are easier to assemble with cream. 6. 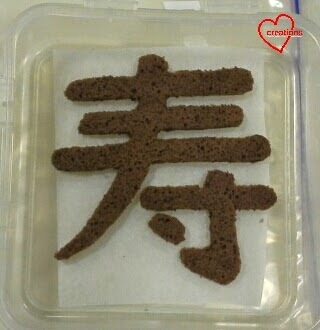 Carefully cut the layer cake to form the "寿" character (it means longevity in Chinese). Double wrap it in cling wrap tightly and freeze it. It will be easier to place a thin rigid cake onto the assembled cake than a soft floppy one. You may brush some syrup on the cake to prevent it from being too dry. But since it's a decorative piece you may omit this step. I couldn't resist eating the trimmed portions of the 6" cake (There was a small dome as it was a tall cake. Baking flat layer cakes won't have this issue.) and couldn't stop eating! And this is coming from me, a non-chocolate fanatic. The cake is so fragrant, flavorful, soft and fluffy! 1. Make the snowskin. Sift together sugar and kou fen into a bowl. Combine water, pandan flavouring and shortening in a small saucepan. Heat over low heat and stir until shortening melts. Pour into flour mixture and stir with a spatula until a dough forms. Leave it to rest for 15 minutes to cool. Knead until smooth. Divide the dough up for colouring. 2. Colour the pieces accordingly with food colouring. Tools I used are a flower cookie cutter, fine brush for painting the flowers, butter knife to make imprints on the flowers and for cutting the stems. Dust the dough with a bit of kou fen if it gets too sticky to work with. 3. Store the pieces in air tight container in the fridge until ready to assemble. You may make this a day in advance. 1. Add all ingredients except cream in a large mixing bowl. Add 3 tbs of cream and mix well with a spatula/ whisk. Gradually add the rest of the cream, mixing well with each addition. 2. 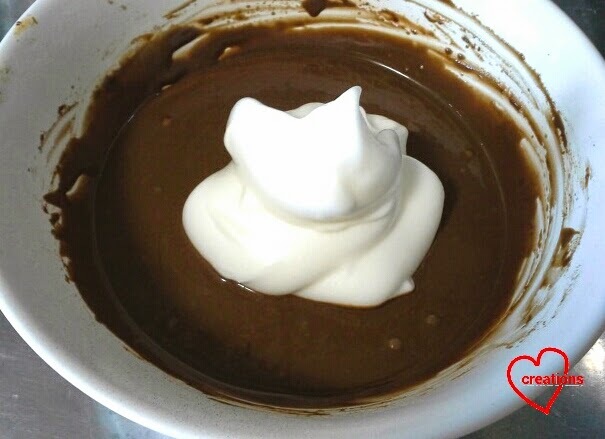 Use an electric mixer to beat the chilled cream until just stiff peaks form. Place the mixing bowl in an ice bath to keep the cream cold. 1. Place one frozen 6" layer on a cake board mounted on a turntable. Apply a layer of cream on top, letting some cream fall over the edge of the cake. Place another frozen cake to sandwich thr cream, pressing it down firmly and let any excess cream bleed out from the sides. Repeat until all three layers are assembled. 2. Place a large dollop of cream on top of the cake and use a large offset spatula to press the cream down. Cover the sides with cream. Many experts recommend crumb coating the cake first before applying another layer of cream. I intended to do that but the first layer of coating stayed so well and the cream was so easy to work with that I just proceeded with creaming the whole cake! 3. Add on the snowskin fondant decorations carefully. I got a bit careless since it's my first time decorating a cake this way so I accidentally messed up bits of the cream. Oh well :p.
I had leftover layer cake and some cream so I made a "plank" cake! Preliminary test for log cake :p.
Hubby and my parents sampled this and said the flavour of cake with cream is superb without being too sweet. My mum took the rest of the leftovers to share with my extended family and immediately booked me for a logcake with this flavour! Update: My friend said everyone found the cake beautiful and her mum liked the taste of it. The cream was good. Opinion for the sponge cake was divided though with half of the family liking it and the other half not. I suspect that I didn't wrap the cakes tightly enough before freezing so the texture was affected, quite different from what it was freshly baked. 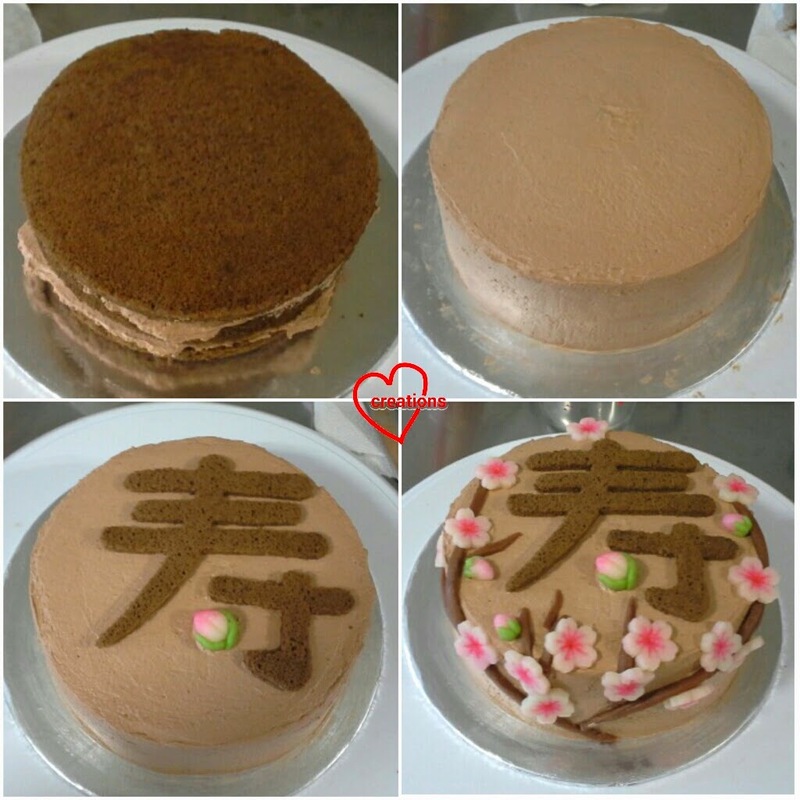 I might also bake 3 separate thin layer cakes in the future instead of one tall cake sliced into three. Great learning experience for me :). 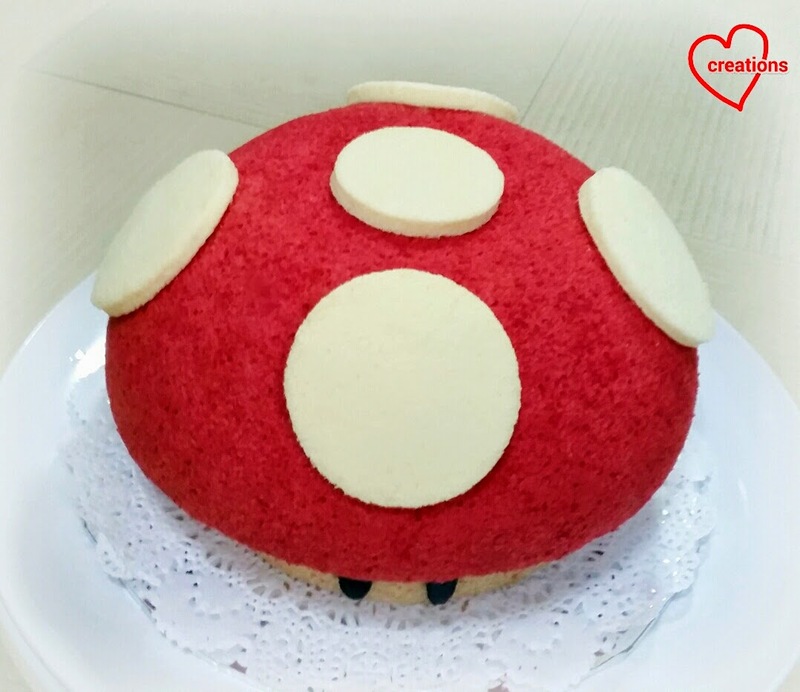 This is a Super Mario Mushroom cake created specially for my jc friend's son and wife's birthday as mummy. He told me she really loves mushrooms so he really wanted to give her a special surprise (so super sweet ;)). 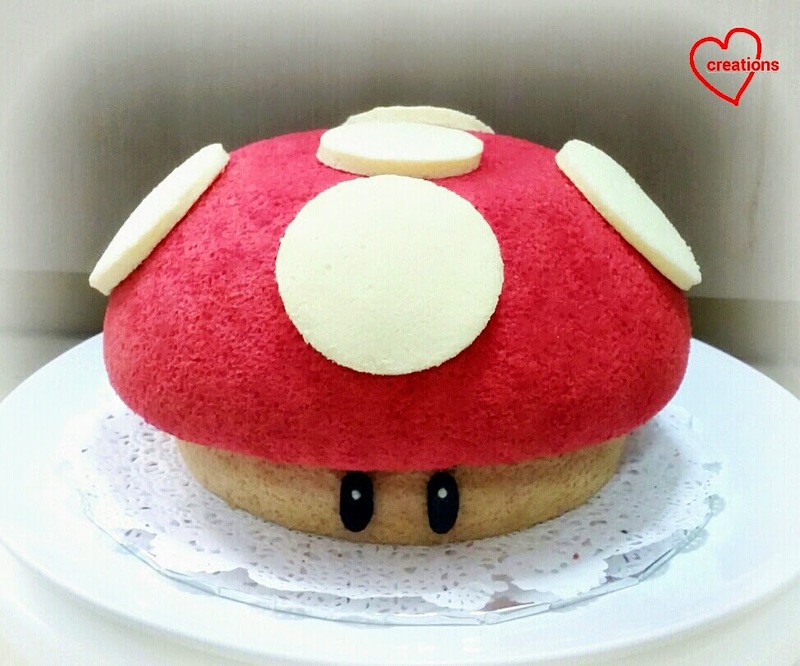 The Mushroom cake is made completely out of chiffon cake and tri-flavoured (Neopolitan): strawberry (head), chocolate (base) and vanilla (patches). I didn't have a round cake mold big enough for the head of the mushroom so guess what I baked the mushroom head in... a stainless steel mixing bowl! LOL. I'm serious, and it worked! 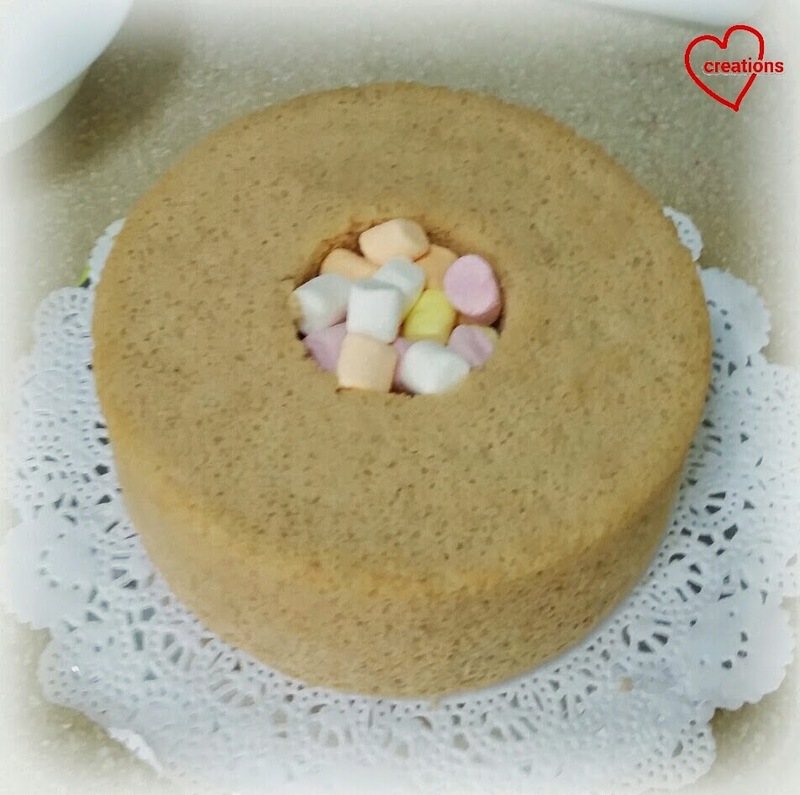 The base was chocolate chiffon cake baked in a 15 cm chiffon tin, and the patches were cut-out from layer vanilla chiffon cake and glued on with melted marshmallows. 2. Beat egg yolks with sugar with whisk till pale yellow before stirring in oil, water, vanilla extract and strawberry paste. 3. Add in sieved flour and red yeast powder and whisk till no trace of flour found. 6. 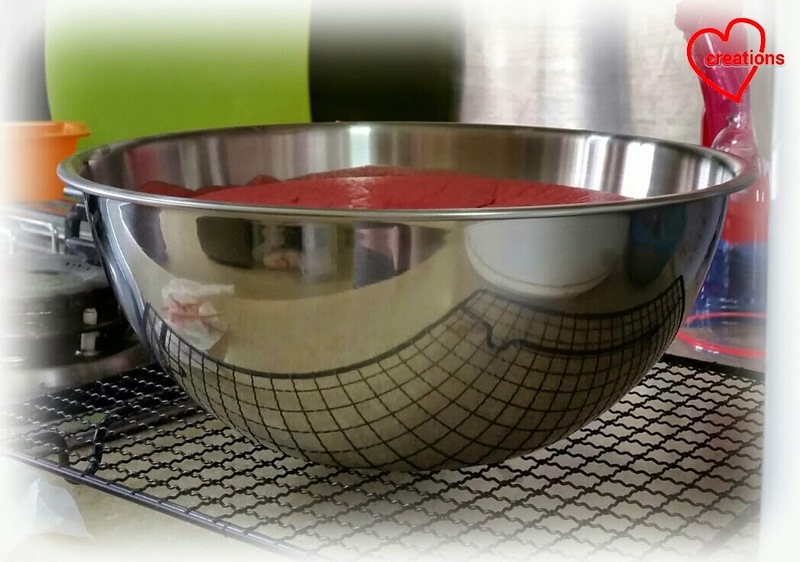 Scoop the batter into the bowl and gently tap the bowl on table to remove air bubbles. 7. Bake the cake for 15 min at 160°C then 30 min at 150°C and then 25 min at 140°C. 8. Leave to cool on cooling rack once out of the oven to cool. 9. Unmould after the cake is cool. 7. Bake the cake for 15 min at 160°C then 25 min at 150°C. Freshly unmoulded chocolate chiffon, with a colorful surprise! 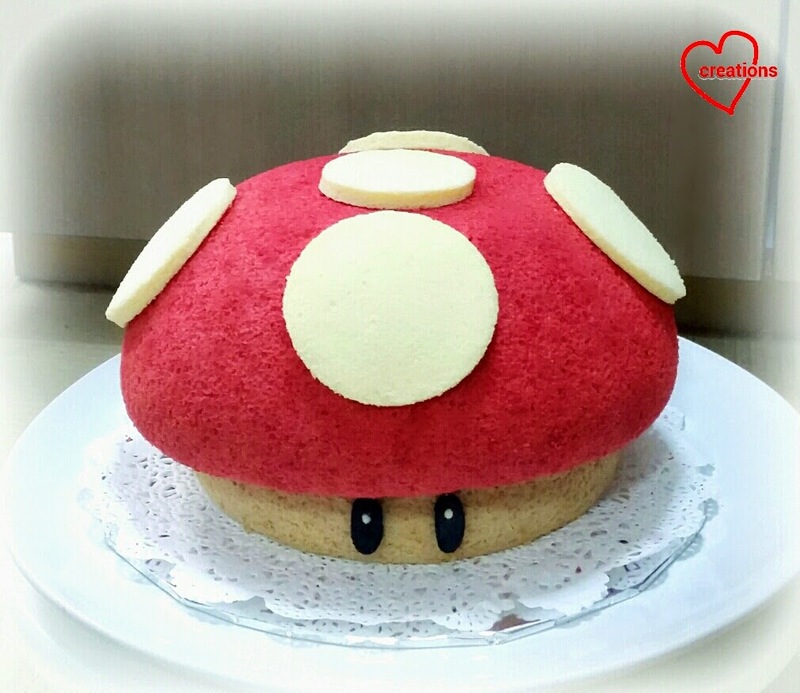 Join the head and base chiffon cake together, and you get a mushroom! The base will be slightly compressed but it looks more mushroomy! And if you bake a good chiffon cake, the base should spring back once removed. 6. Gently scoop and level the batter in a baking paper-lined 9-inch tray and gently tap tray on table to remove air bubbles. 7. Bake the cake for 15 min at 160°C. Decorate with white vanilla patches, and you get a Super Mushroom! 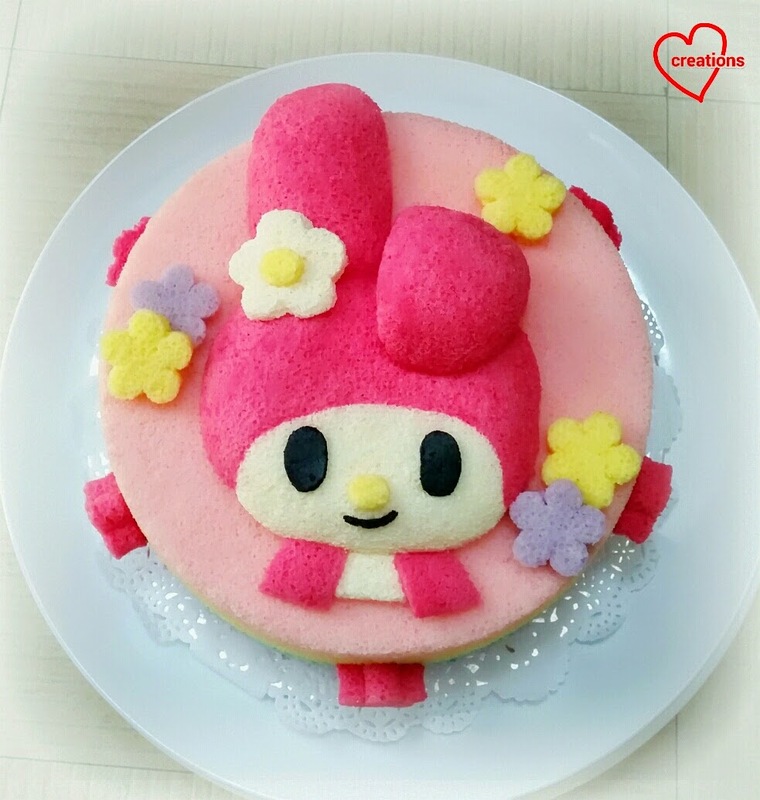 Thank God my friend and his wife shared that the cake was "delicious, yummy, light and spongy, and a dream come true!" (these were their exact words, thank God :)). And here's the mushroom peeking at you! 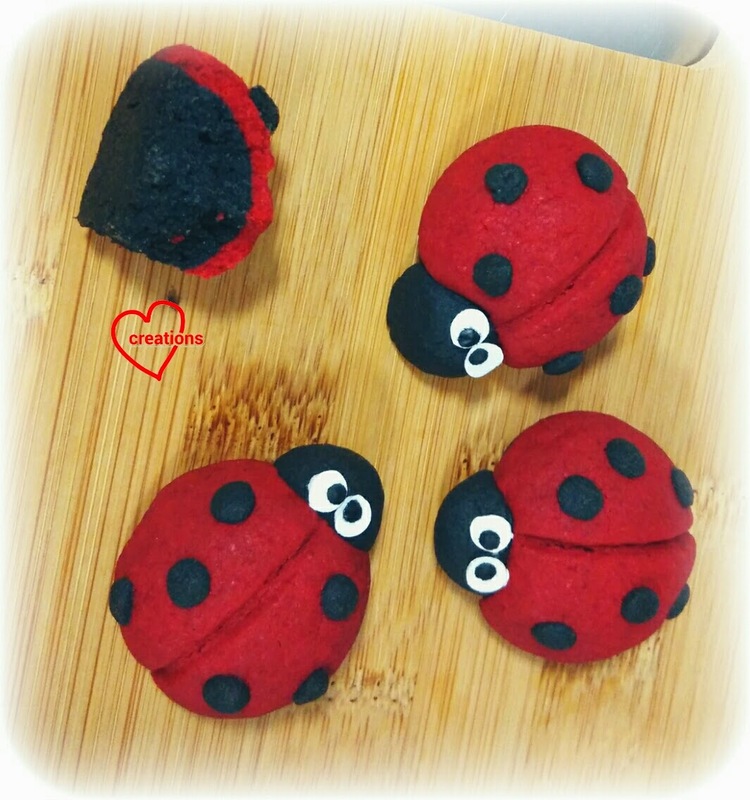 :D Baking for them was really joyful! Happy birthday to Danzel and Jan! 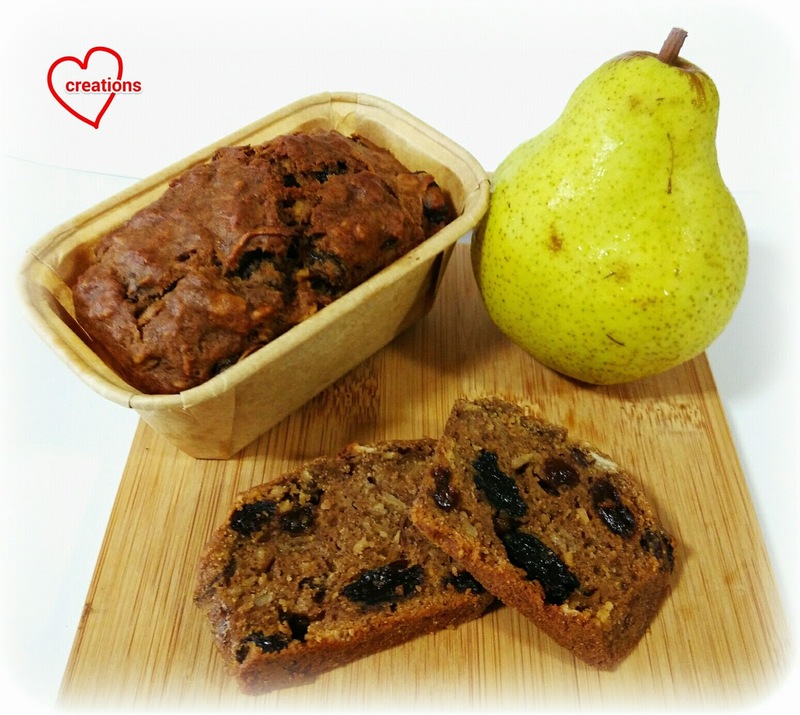 When I was still dating, I used to bake pear and raisin(sultana) teabread for my hubby-to-be. Being new to baking, I found this really simple to bake with no creaming or kneading techniques and electric mixers involved. But it's really fragrant and wholesome! Perfect for breakfast and tea :). Finally sharing something that is down-to-earth, a break from all the fancy stuff :p.
I adapted the recipe from "Low-salt cooking" by Michelle Berriedale-Johnson, a recipe book I had since I was still studying in University. 1. Soak the raisins in pear or apple juice until plump. You may soak overnight or at least half an hour. If you are in a rush, you may skip the soaking but the raisins will not be as moist and juicy. 2. Coarsely grate the pears. *If you don't have apple or pear juice lying around the house, you may use the juice produced from grating the pears to soak the raisins. 3. 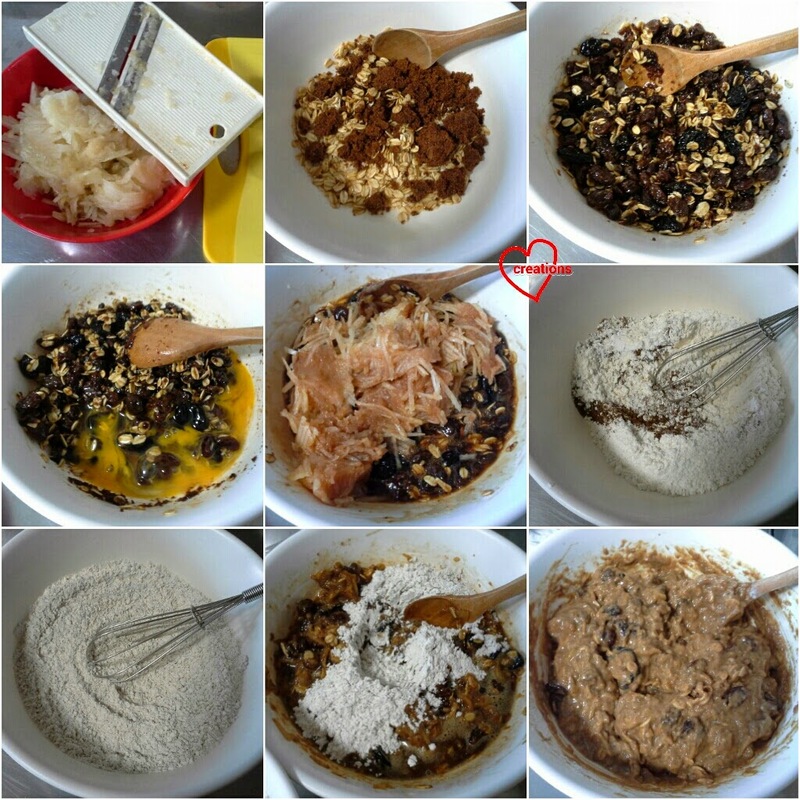 In a large bowl, put oats, sugar, oil and raisins. Mix well and leave to stand for 15 minutes. Preheat the oven to 170°C. Line or grease your moulds/tins. 4. Stir in beaten egg, followed by grated pear. 5. In another bowl, put flour, baking powder and mixed spice. Use a hand whisk to whisk the mixture thoroughly. Alternatively, you may sift together everything. Whisking it produces the same effect but in a more convenient way. (Whisking flour is fine for teabreads but not for chiffon cakes and macarons). 6. Fold the flour mixture into the pear mixture in 3-4 batches until no trace of flour is seen. Do not overmix or your teabread will be tough. Fill your moulds until about 80% full. 7. Bake for 25-35 minutes or until skewer comes out clean. Transfer the teabread to a wire rack. Leave to cool completely. My family and friends love this stuff so do share this with your loved ones too :). This bake is simple enough to get kids involved too, which I did on another occassion. 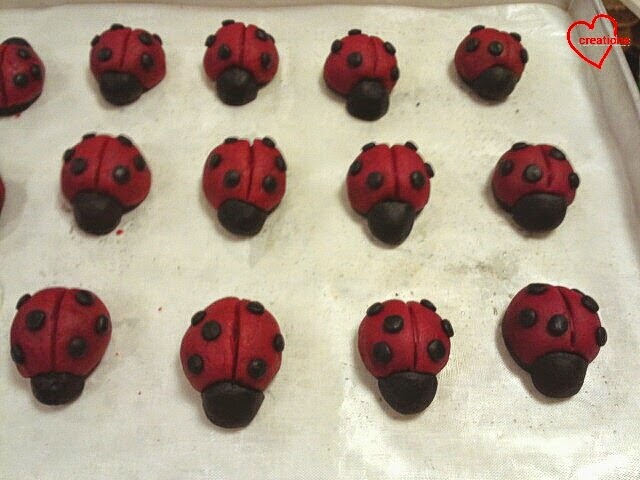 This batch of ladybug butter cookies came about by accident but the neighborhood kids sure love them! *Nomnomnom* Chiffon cake leaves taste good! Leftover from Mama's previous bake. 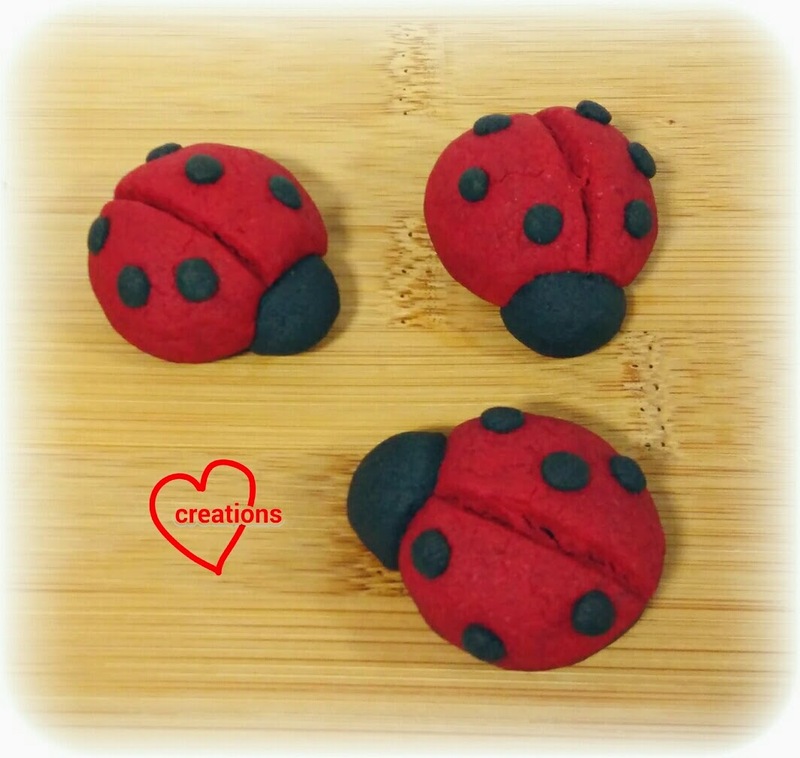 * You may want to triple the portion for red dough and use one-third of the portion for black dough if you prefer the bug to have a solid red coloured body instead of a black body with red shell like mine. 1. In a large bowl, cream butter and sugar by beating with a wooden spoon until pale and creamy. Take a few minutes to do this. You may choose to use an electric mixer for this but I prefer the control and workout :p.
2. Dissolve the salt in the milk and add strawberry paste/ vanilla extract. Dissolve the beetroot powder into the milk for the red dough as well. 3. Gradually add in the milk mixture and beat until well combined with each addition with a spatula. 4. 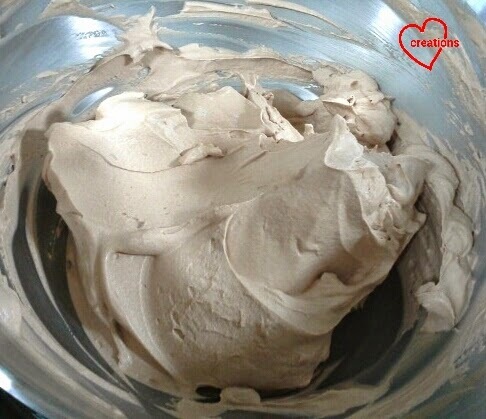 Mix the corn flour and charcoal powder/ red yeast and red colour powder with plain flour well. Gradually add in sifted flour mixture and fold in with a spatula. 5. 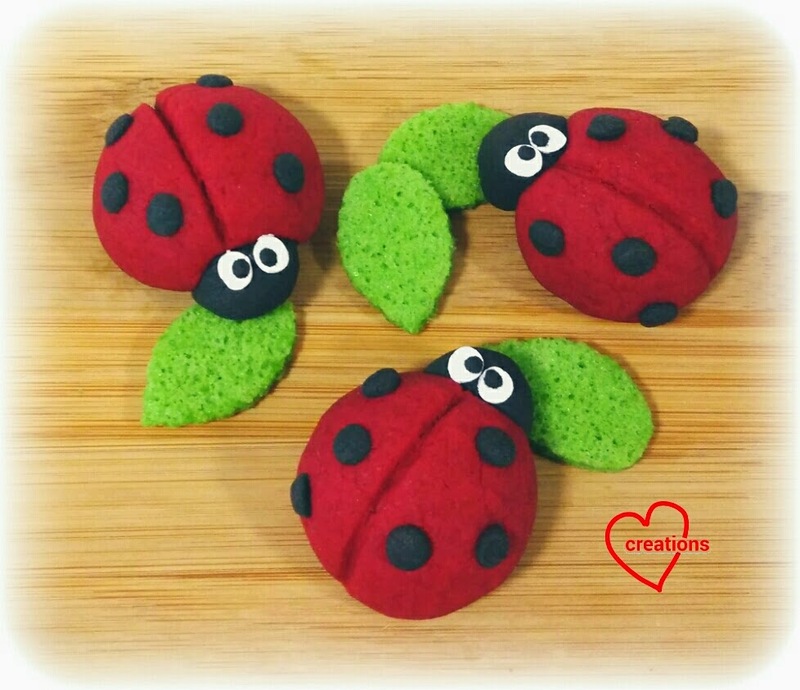 Shape the ladybugs and place them on baking trays lined with baking sheet. I used a round ice cube tray and melon baller to help in portioning and shaping the head and body, piping tip to cut out the dots and a toothpick to paint on the black pupils of the eyes later on after baking. A butter knife was used to draw the line on the bugs (not shown). A round cutter slightly bigger than the ice cube tray was used to cut out the red shells of the bugs. This is not necessary if you choose to use only red dough for the body. Or you could add on some cute eyes. I had some confetti sprinkles so I picked out the white circles in the batch of rainbow coloured ones. I used marshmellow creme to stick the circles on with the help of tweezers (the circles are only about 4-5mm in size!). The pupils were drawn on using charcoal dissolved in water and the blunt end of a toothpick as a stamper. You get pupils of the same size and shape that way. Alternatively, you could use royal icing to paint the whites of the eyes...but I went for the fastest and easiest way :p.
Waiting for charcoal paint to dry and starting to look even cuter! Wonder why they look shocked? They watched the demise of their friend, that's why! 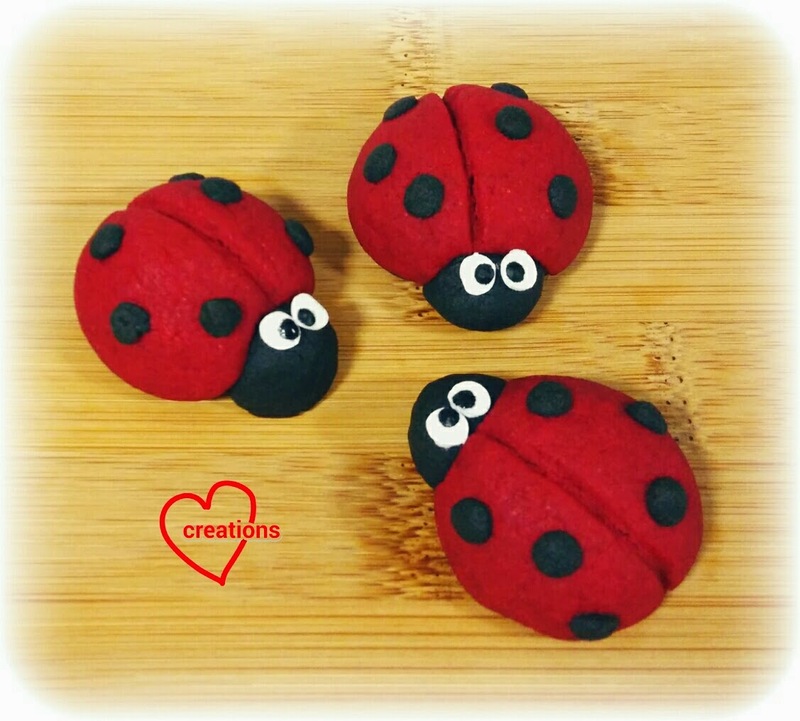 I had fun making these and my elder kid who has been home for a few days played around with some left over dough too! 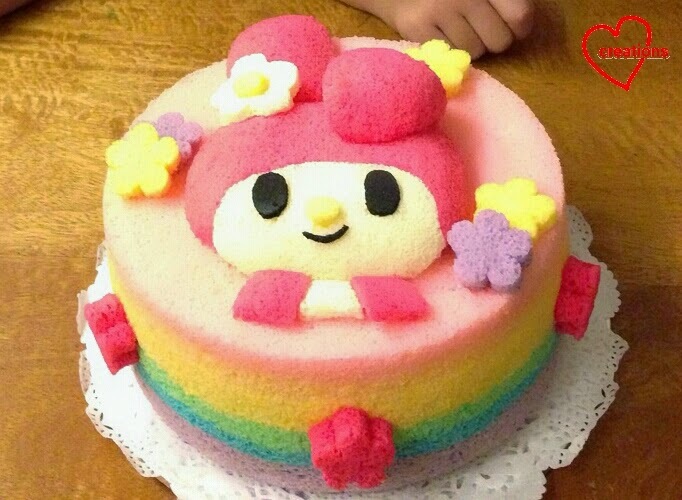 This is a My Melody rainbow chiffon cake I absolutely loved doing for my friend Dorothea's daughter's birthday because My Melody is sooo adorable! 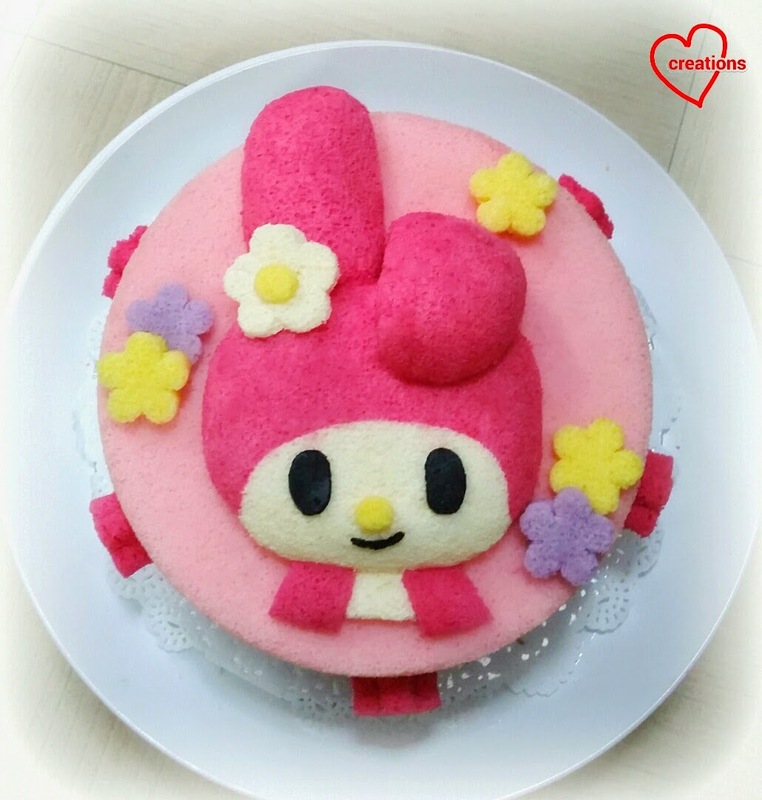 The face is made from vanilla chiffon cake using the same recipe and protocol as my Hello Kitty chiffon cupcakes except that I baked the face in a glass oval bowl (inherited from my parents) and used strawberry paste + red yeast powder on the pink portion. 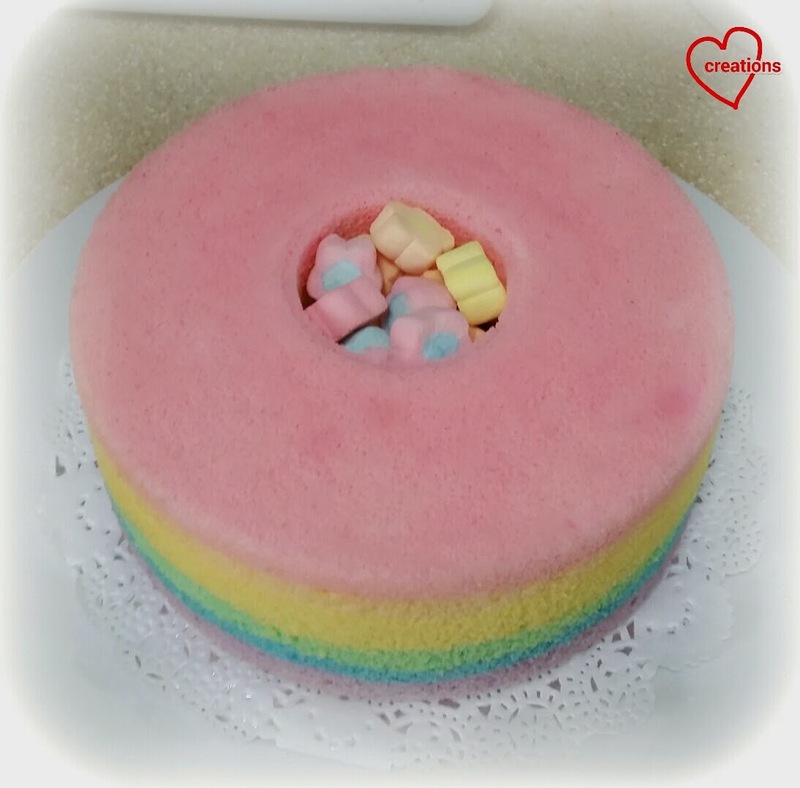 The base cake is rainbow chiffon cake using the recipe from Pastel Rainbow Chiffon Cake. I forgot to take a picture of the rainbow layers in my rush to make the cake. Thankfully my friend sent me a picture of the cake with her adorable kids! The rest of the details are cut out from excess cake batter and glued on with melted marshmallows. Opps and I forgot to mention the marshmallow flowers surprise I had for her in the cake till Dorothea mentioned how much her daughter liked it ;) Thank God she shared her kids enjoyed and loved the cake! Happy blessed birthday to Abbie (thank you Dorothea for giving me this privilege to make this cake for her)! 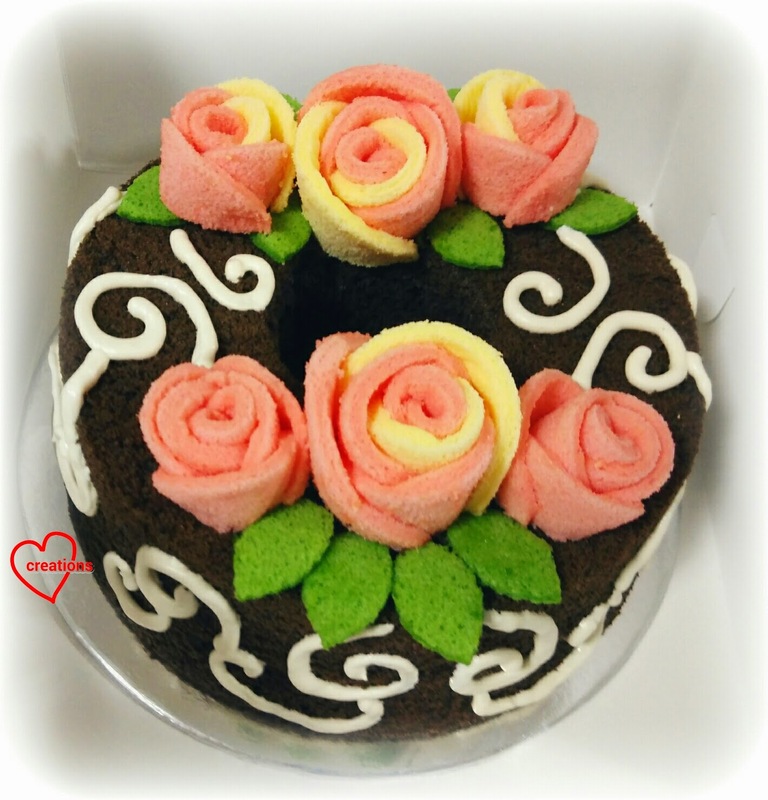 My mum's friend would like a pulut hitam (black glutinous rice) chiffon cake so I made one for her, topped with chiffon roses and leaves, and decorated with gula melaka (palm sugar) flavoured royal icing :). Yes you can make pretty chiffon roses without a mould! I borrowed the idea from making steamed rose buns. 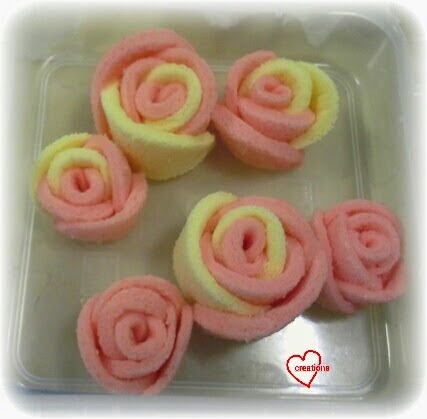 I thought since chiffon cakes are so soft and bendy, it should be possible to make chiffon roses from thin layered cakes. My dad thought gula melaka goes well with pulut hitam so I added that in to my recipe. The original pulut hitam recipe I had generated a queue for the cake so this should be good too! The amount of caster sugar in the meringue for the pulut hitam cake was reduced so that it could accommodate more palm sugar in the egg yolk batter without making the whole cake too sweet. 1. Preheat the oven to 160°C. Line one 10" square tray and two 6" square trays with baking sheet. 2. Prepare egg yolk batter. Whisk egg yolk and sugar until pale. Add oil and whisk until thick like mayonnaise. Add milk, pandan flavouring and vanilla extract and mix well. Gradually add in sifted flour and salt and whisk until no trace of flour is seen. 3. Divide the egg yolk batter into ratio of 3:1:1 for pink:yellow:green. 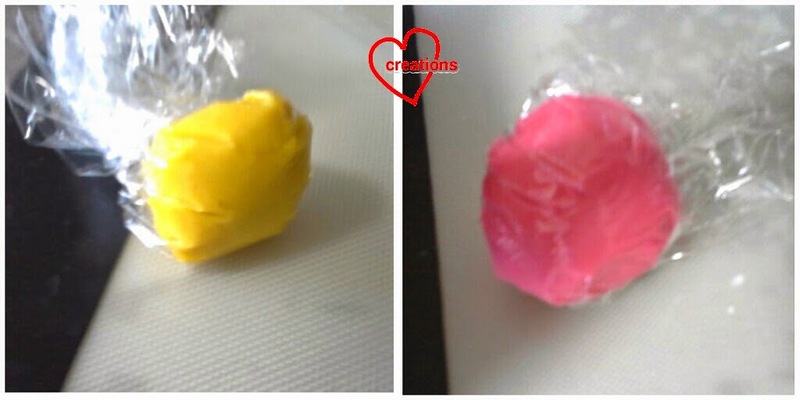 Add pink colouring to the largest portion and green colouring to one of the smaller portions. If you would like your roses in one colour, just portion the egg yolk batter in the ratio of 4:1 for pink:green. 4. Prepare the meringue. Beat egg whites in a clean metal bowl with electric mixer until foamy. Add cream of tartar and beat until soft peaks form. Gradually add sugar and beat until stiff peaks form. 5. Fold the meringue into each egg yolk batter in 3 additions. I used a Chinese soup spoon to portion the meringue in the respective ratios. Not exact portions but good enough. Pour the batter into the trays and level the batter gently with a spoon or spatula. 6. Bake for 8-9 minutes. Immediately remove from pan and peel the baking sheet off gently (cakes are very thin). Place another sheet over to cool. 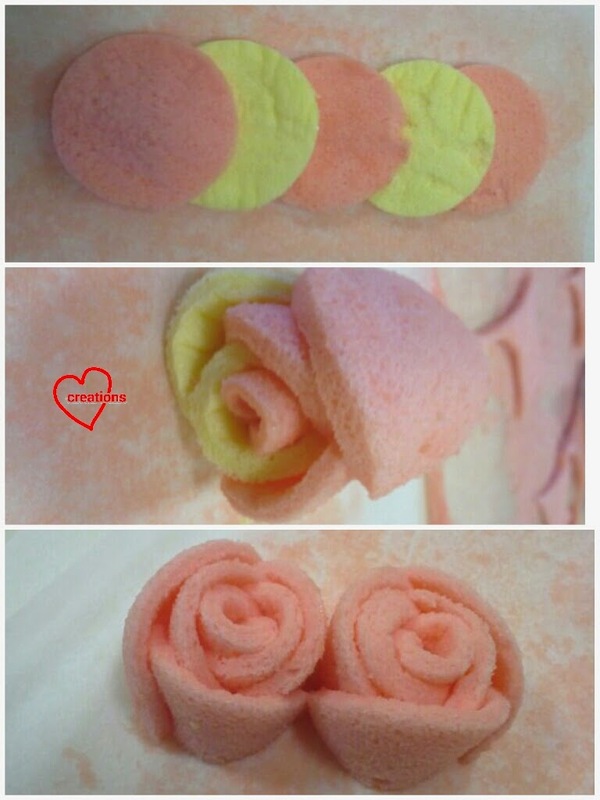 Roll the pink and yellow cakes like a swiss roll with the baking sheets on to cool. 7. Use round cookie cutters to cut out circles from the pink and yellow cakes. Use a leaf cutter to cut out leaves from the green cake or you can cut freehand using a knife. Be sure to store the tiny pieces of cake in airtight container as you are working to prevent them from drying out. Assemble the rose by arranging the circles in a row, overlapping each other (first picture below). Roll the whole assembly as tightly as you can like a swiss roll (second picture). Slice the roll in half with a serrated knife using a gentle sawing motion... and you get 2 beautiful roses (third picture). Glue the outer petals together using melted marshmellows or if you are lazy like me, use marshmellow creme from a bottle bought from the supermarket. Store the roses in an airtight container at room temperature until ready to assemble onto the base cake. 1. Preheat oven to 160°C and position the rack to second lowest position. Line a 17cm chiffon tin with cake strips. This is optional but it helps your cake to rise more slowly and you get a taller cake. I used homemade ones made out of wet newspaper wrapped in aluminum foil. My batter only filled the tin to about 2/3 full but the resulting cake was almost the height of the tin after cooling. 2. Prepare the egg yolk batter and meringue in a similar manner as the above, adding the ingredients into the egg yolk batter in the order that is listed. 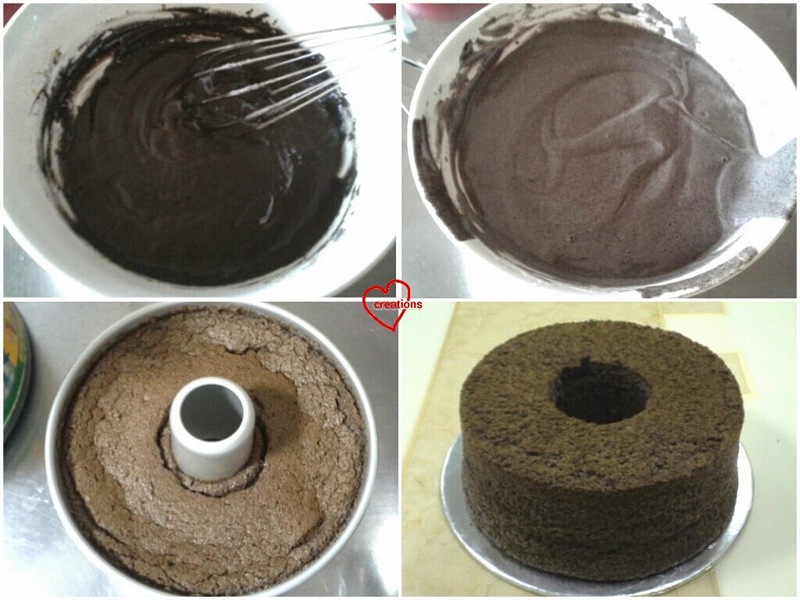 Charcoal powder was added to make the cake appear more black so you may choose not to use it. 3. Pour the batter into the chiffon tin and tap it on the table a few times to release air bubbles. Bake at 160°C for 20 minutes, followed by 150°C for 30-40 minutes. Reduce the baking time by 5-10 minutes if you are not using cake strips. Use a spatula to lightly press the top of the cake to test if it is done. If it springs back, it is done. Immediately invert to cool after removing from the oven. Carefully unmould by hand/ spatula. This cake is softer than regular chiffon despite the high flour:liquid ratio. 1. 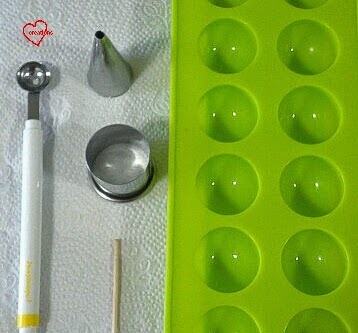 Prepare some gula melaka royal icing. You may omit the gula melaka or choose to add more depending on your personal preference. I only used approximate measurements so pardon me for not providing the exact recipe for this. A lot of it is adding a bit of this and that until I feel the consistency is just right for piping patterns onto the cake. I just dissolved some gula melaka in hot water and used the water to add to the mixture of icing sugar and meringue powder to make the royal icing. Transfer the icing into a piping bag fitted with a Wilton #5 tip. 2. Position the flowers and leaves onto the base cake as desired. Use the royal icing to glue them into position, then pipe Arabesque patterns onto the cake. I accidentally chose a tip that was too large so the patterns did not come out as dainty as they ought to be. Store the cake in an airtight container in the fridge. Best to consume it within 3 days. So glad that the experimental roses turned out well! They really pretty up a plain black cake very well! 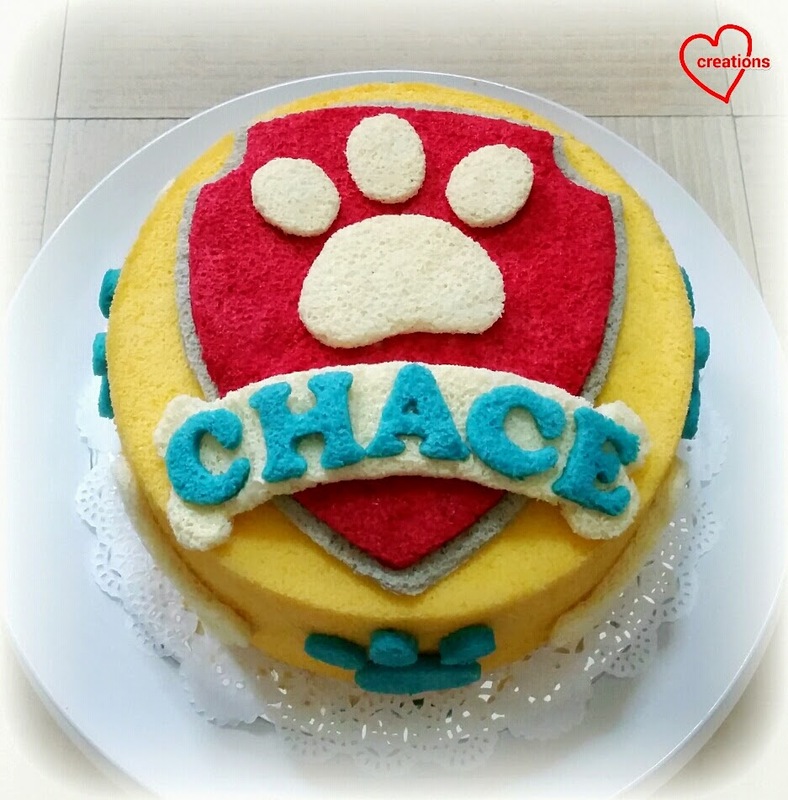 This is a Paw Patrol chiffon cake made especially for Chace who loves Paw Patrol! :) Because of him, my kids also started watching the cute series. My favorite scene is when the pups glide down the slide into their vehicles LOL! This cake is inspired by the Paw patrol crest on the tower, and to make it more special, I put his name on the bone ;). This is a fun cake with paws and bones running all over the cake! I made a total for 4 vanilla chiffon layer cakes (red, grey, blue and white) to cut them out. And to make it even more fun, I even hid a few bones inside the chiffon cake (just some cake trivia) :p.
The base was orange chiffon cake adapted from sakura orange chiffon cake. This is an updated recipe in which I increased the orange juice and modified the baking temperature to further reduce to 140°C to reduce browning, which was important here as I needed a light orange cake as base for the blue paws. 1. Preheat oven to 160°C. I use steam baking with a thin layer of water in a pan under the lowest rack (optional but helps to control oven temperature). 2. Beat egg yolks with sugar with whisk till pale and light before stirring in oil and orange juice. 3. Next add in sieved flour, orange zest and a few drops of orange emulco and whisk till no trace of flour is found. 4. Meringue: Beat the egg whites with ¼ tsp cream of tartar till firm peaks or close to stiff peaks, mixing in caster sugar in 2 additions. 7. Bake the cake for 15 min at 160°C then 30 min at 140°C, or until skewer comes out clean. 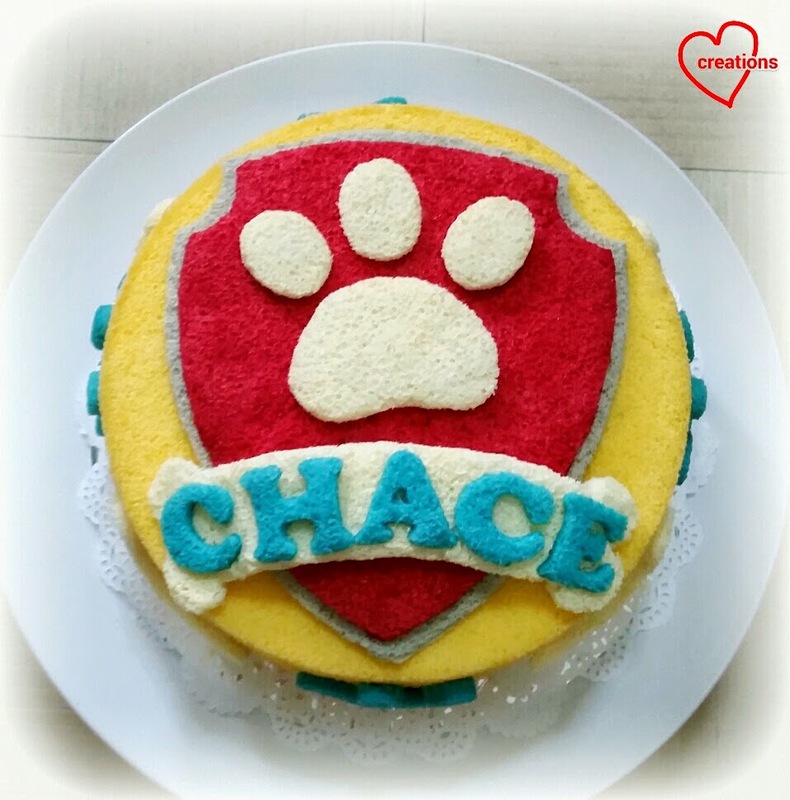 Here's the top view of the Paw Patrol Chiffon Cake! Happy blessed birthday to Chace!